We finished our drive from Tomah, Wisconsin, in Monroe County, through Vernon County, and into Crawford County where I grew up on a farm 2 miles northwest of Seneca. We have been on Highway 27, the Black River Road, which runs down the spine of the Crawford County, from Sparta, to Viroqua, and down to Prairie du Chien. In the mid 1800s, Seneca was an overnight stagecoach stop between Prairie du Chien and Black River Falls. We’re in Prairie du Chien, Wisconsin right now, having motored through Rising Sun, Fairview, Mt. Sterling, Seneca, Eastman, and dropping down from an elevation of 1140 feet to 600 feet into the Mississippi River Valley by way of Mondell Hill. 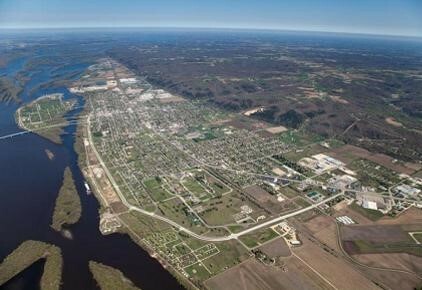 Prairie is the second oldest city in Wisconsin and founded by French voyageurs in the late 1600s. Named for “dog’s prairie”. My brothers, Phillip and Bob, and I were typical teen boys. We were lucky in many ways, as I look back over those years. We were isolated out there in farm country. There was no chance to have beer parties, or illicit drugs, and or wild women. There were no wild women. They were all farm girls who worked as hard as we did. Bill Boland was probably our best friend. We went to dances at the Quonset hut type building called the Checkerboard in Prairie du Chien on Sunday nights. At about this time, in the mid1950s, go-carts were just coming out. Someone came up with the bright idea of putting a lawn mower engine on a platform that was three inches off the ground. Prairie du Chien put in a go-cart track. Those machines were loud, smelly, and belched fumes. With such low center of gravity, there was no way to tip them over. They were expensive to ride, but we did it a few times. Ran into each other and into the car tires that lined the track. Baseball pitching machines were also new. It was something else to separate a farm boy from his money. We just had to try those new amusements. Conoco gas stations gave out dishes, which were displayed in cases between the pump aisles. The more gas you bought the bigger the prize or award one could pick out. They gave away dishes, drinking glasses, towels, boxes of tissue and cereal. After the dance, pitching machines, or go-carts, we would go to one of the teen hangouts for snacks. A favorite was the Stop N Bop Restaurant just off the main drag in Prairie du Chien. The Stop N Bop had a jutebox,10 cents for a song or three for a quarter. Sometimes we patronized the A&W Root Beer stand. A young lady, usually a high school student, would come over to the car. We would roll down the window and do our ordering. Chili dogs and a Root Beer was the standard order for the Scheckels and Bolands. That was not the end of it. The young lady returned and we would order two more Root Beers. Root Beers are served in a heavy glass stein with a handle on the side. She might return several more times, we ordered several more. She removed a few empty glass steins. In all this ordering and reordering, she was confused about how many total steins were brought out. In the process, we usually ended up taking a stein home. Somehow we didn’t see that as stealing, but it probably was and another venial sin to confess. I believe we put that in the same category as stealing watermelons in late Summer or early Fall. Sort in that gray area of right and wrong.